I saw this painting by Wellem van Haecht in the Rubenshuis in Antwerp. 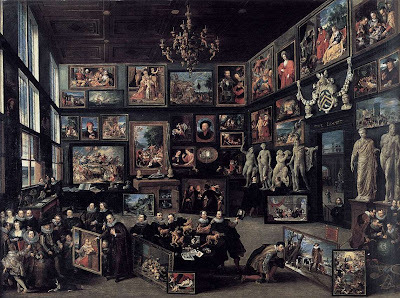 With touches of fantasy added, the painting depicts identifiable personages and part of the collection of art patron Cornelius van der Geest in a grand chamber in his townhouse near the river Schelde. The room in which the painting hangs today dates from the same period and is similarly overladen with Baroque art, creating a disorientating sense of double exposure. I used a postcard reproduction of the painting as bookmark for the six months I was living in Antwerp. This elite prism intermingling real and imaginary personalities is not unlike Andy Warhol’s Factory. Warhol with his kaleidoscopically generated abundance, a living parody, is an artist of the Baroque sort. But an even more contemporary analogy can be made between this painting as a virtual gallery and the supremely baroque (and banal) spectacle of the Internet. The important thing about Aucklantis from the point of view of Chua’s concept of a minor cinema is that the world it evokes is a surreal, interior one. We have been conditioned to imagine the Internet as a kind of interior space, as if it allows us vicariously to return to the womb or some otherworld. This notional step 'inward' through an external interface makes the Internet into a mythic inversion of reality. A premise of The World Blank series, to which Aucklantis belongs, was to ‘browse’ my exterior surroundings as if they were 'online'. In Aucklantis this calculated estrangement from my surroundings was used to allude to an 'otherworld' (Aucklantis) beneath Auckland. At the same time, I continuously alluded to an othermovie, a Platonic movie if you will, behind the b-grade 'vlog' I appeared to be making. In reducing film-making to a series of prosaic evocations, I was certainly trying to critique (though not renounce) the presuppositions of cinema in general, but I was also inadvertently exploring a sensibility Chua calls "interiorism". Interiorism is less distinguishable as a particular set of codes than a certain attitude or 'mode' which influences how and why we observe and represent things. The Warhol screen tests, for instance, play up a certain sense of isolation and imprisonment in exteriority by reducing their subjects to weird simulations, to “things as they are observed”. And yet these "tests" often provoke subtly and movingly personalised reactions (or 'interiorised' simulations). Warhol’s externally fixated gaze brings us perversely to an interior cinema of engaged estrangement. My purpose in referring here to canonical examples avant-garde cinema (Warhol, Duchamp) is not to identify Minorism with Avant-gardism (though they are associated ideas) but simply to ground the abstract dichotomy of “exteriorist” and “interiorist”, which otherwise becomes a reductive dualism. Likewise, Chua carefully nests his definition of minor interiorism between specific examples of it in art, namely surrealist depaysement (disorientation) and Sedgwick’s “reparative impulse”. These concrete precedents guide us towards a practical definition of “minor cinema” which connects obviously and enlighteningly other forms of minorism. Perhaps the exemplary (and originary?) exposition of Minorism is Gilles Deleuze and Felix Guattaris' theory of a minor literature. This theory uses the works of Kafka as a Czech Jew who wrote in German to demonstrate that all critical language must operate within the confines of a dominant language and culture. An Internet novelist like Jack Ross who explores the subversive possibilities of appropriated and recycled texts interwoven as blog entries is arguably working in the tradition of minor literature. I invited Jack to come and speak tonight partly because of this parallel between a minor literature and a minor cinema, which I hope might put the question of a minor cinema into a larger cultural, historical and philosophical context. This brings to me to the purpose of this event, which is not to discuss technological horizons but rather to consider the cultural and artist impact of widely available new media technologies. Understandably, many of us often talk (or complain) about the maddening technical constraints, the incoherency, the transitory value of this technology. But the real question is who these new cultural tools are going to serve and in the name of what. Without doubt, they are designed to favour the dominant language and culture within which critical language has to operate. Hence the need for minor discourses, without which I am suggesting we are “flying blind”. In another sense, “flying blind” can itself stand for the ‘minor’: a pioneering, engaged “estrangement”, in short a heroic new media amateurism. A canonical example of such heroic technical 'make-doism' is Praise of Folly, which Erasmus wrote in 1509 in the space of a week while sojourning with his mate Sir Thomas More at his estate in Bucklersbury. Aside from being one of the catalysts of the Protestant Reformation, the book is one of the wittiest and most alive things you will ever read (along with More’s own Utopia). Its energy comes firstly from the anarchic spontaneity of the original text but also because the author did not simply pass it over to a publisher. Erasmus personally presided over the printing of the first editions, further invigorating the work with a very hands-on approach. 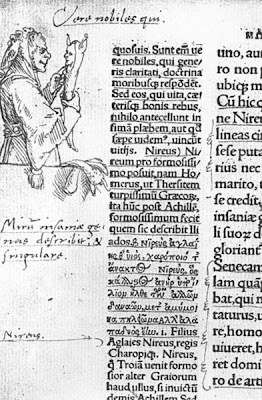 The sense of rugged elegance which characterises the prose is apparent at a glance, as can be seen in this detail from a copy owned by Erasmus himself which shows us a margin illustration of Folly by his friend Hans Holbein. “Hans Holbein's witty marginal drawing of Folly (1515), in the first edition, a copy owned by Erasmus himself (Kupferstichkabinett, Basel)”. With its playfully interruptive deployment of Greek script and other inscriptive licences the book emanates the excitement and delight in disruption that must have been felt by writers at the dawn of the age of the printing press, an age coincidentally of great political scandal and turmoil. Indeed, it is as if the manuscript and the mechanical copy still conceptually overlap at this early stage of the printing revolution. Today, one gets an equivalent sense of exuberant, scholarly experimentation in Jack Ross’s deliberately crude explorations of the possibilities of the hypertext, and furthermore in the way he uses these ideas to push the boundaries of the printed book or "codex" as he calls it. Once again, we see a positive overlap between a newer and older technology. All this has a lot to do with the theme of purposeful disorientation I sounded at the beginning, which in the case of Humanism is linked with a politicised subjectivism. Far from the stodgy received image of irascible Erasmus, Praise of Folly shows him to be a devastatingly articulate upstart, an improvisor boldly embracing at once a new medium and a new regard for subjectivity. Erasmus' Humanist outlook was interiorist in that it posited an intrinsic grace, an autonomous self-determination in man, opposing the fundamentalism of the Scholastics who believed that “The way to salvation was through the acceptance of norms of belief and behaviour extrinsic to the mind’s need to understand its experience and to the moral aspirations of the individual.” (Introduction to Praise of Folly, p. 25 - my italics). Erasmus’s use of satirical humour was both humanistic and a tactical measure against being branded with heresy by the Scholastics. On the other hand, he might not have published Praise of Folly if he’d known it was going to help bring about the Protestant Reformation. This is the folly of all authorship, not to mention a clear case of literature operating within the confines of a dominant language and culture (as Deleuze and Guattari say) whereby the work may even serve purposes abhorrent to the author. Reader’s of later centuries are glad the book was published, regardless. It is surely a cliché of modern culture that any historic act will have multiple destinies. I recently caught Werner Herzog on some You Tube clip talking about the process of making a film as “a chain of banalities”. True, but the filmic afterlife is also fraught with nuisances. Herzog of course has his eye not on the banalities but on the chain, on the multifaceted nature of any event, no matter how incidental, from which a minor cinema will not detach itself wholly. He knows that the key to his work's survival is in those very banalities that plague him (like some absurd doppelganger as in the photo/clip below). In embracing this chain of banalities the lack of control we have over circumstances now or in the future does not obscure our ideas and concerns. Above all, it thwarts the impulse to accept “transcendentalising values”. “The simulacrum is never what hides the truth – it is truth that hides the fact that there is none. The simulacrum is true”. This talk uses a cinematic backdrop against which I am reciting the text. Some of you may have become absorbed by the moving images on the screen and missed parts of the recital or vice versa. Whichever element has usurped your attention more, then let the other stand for the "minor" principle. Mostly, I'm trying to allude to the suffocating ubiquity of the digital screen as a touchstone for contemporary minor cinema. I’d also like to relate a story that might connect the argument I’ve given with its cinematic scenery. I learned lately that Baudrillard’s famous ‘quote’ from Ecclesiastes about the “simulacrum” is a Borgesian fabrication, a wonderful example of minor literary subversion. Perhaps embedded in this ingenious misappropriation of a canonical text is a kind of ironic incitement to “return to scripture”, as the Humanists advised. Of course, Baudrillard no longer equates the real with the true and his ‘return’ involves no digging for vestiges in some old parchment, unless that is they help him to play around with the precession of simulacra, the ultimate cabinet of curiosities. The concept “a minor cinema” reflects a broader disposition, a ghost-tradition even. All the same Chua is very concrete about in suggesting precedents which have been catalysts in the precession of dominant orders. In this talk I have tried to further illuminate Chua’s insight with further examples. To end, I will paraphrase the broad and practical definition given by Chua: opposing a dominant cinema of transcendentalising values, a minor cinema intimately and surrealistically engaged with the phenomenal world and expressing itself though affective imbrication. * "On Exactitude in Science . . . In that Empire, the Art of Cartography attained such Perfection that the map of a single Province occupied the entirety of a City, and the map of the Empire, the entirety of a Province. In time, those Unconscionable Maps no longer satisfied, and the Cartographers Guilds struck a Map of the Empire whose size was that of the Empire, and which coincided point for point with it. The following Generations, who were not so fond of the Study of Cartography as their Forebears had been, saw that that vast Map was Useless, and not without some Pitilessness was it, that they delivered it up to the Inclemencies of Sun and Winters. In the Deserts of the West, still today, there are Tattered Ruins of that Map, inhabited by Animals and Beggars; in all the Land there is no other Relic of the Disciplines of Geography. - Suarez Miranda,Viajes de varones prudentes, Libro IV,Cap. XLV, Lerida, 1658"
Barthes, R. (1977). Diderot, Brecht, Eisentstein. In Image Music Text. Trans. Stephen Heath. London: Fontana Press. Borges, J. L. (1999). 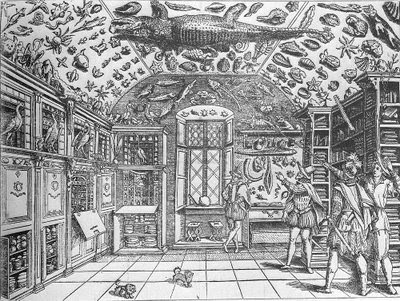 Museum - On Exactitude in Science. Collected Fictions. Trans. Andrew Hurley. New York. Penguin Books. Baudrillard, J. (1994). The Precession of Simulacra. In Simulacra and Simulation. Trans. Sheila Faria Glaser. United States: University of Michigan. Chua, Eu Jin. (2008). A Minor Cinema: Moving Images on the Internet. In The Aotearoa Digital Arts Reader. (2008). Ed. Brennan, S. and Ballard, S. Auckland: Aotearoa Digital arts and Clouds. As a minor footnote to this talk, Gabriel, I wonder if you've come across Georges Perec's late story "Un cabinet d'amateur" [an amateur's collection] (1979), which stars just such an overpacked room of pictures, painted into one work, which turns out to be a forgery of a set of forgeries? The story unfolds with the inexorable logic of Borges but with an even grimmer sense of cultural terror and instability. Having written that, it suddenly occurred to him that he could so the same thing in an even more condensed form by describing a single unfindable book, and so wrote the brief parable Le Voyage d'hiver "A Winter Journey" (1993). Then he died. I very much recommend these late works of Perec's, along with his wonderfully strange autobiography W, or the Memory of Childhood (1975). Thanks for the tip. I might ask for some book tokens for Xmas. This sort of touches on what Stan Brakhage so masterfully explicated in over 400 films and numerous published writings. Though he would never describe his filmmaking as minor he concentrated on personal and localized subjects, family, landscape, birth, aging and death. Brakhage communicated direct visionary experiences, the workings of consciousness, subjectivity in work that directly equated seeing with thinking. I may have mentioned this in my article THE WEST which was mysteriously removed from the Floating Cinemas webpage with no prior consultation, explanation or notification. This is not the way that any artist or contributor should be treated by an aspiring artist-run media arts centre.